Summer is definitely around the corner. The weather is getting better and better and I for one am so happy I could scream. With the harsh Winter we had, I don't think any one should be complaining about the heat this Summer. Not only was the Winter cold and harsh, but it did a number on our skin. Last month I got to review the Vaseline Spray & Go Moisturizers. Not only did it help lock in moisture to keep my skin hydrated, it also saves time when getting ready on rushed days. 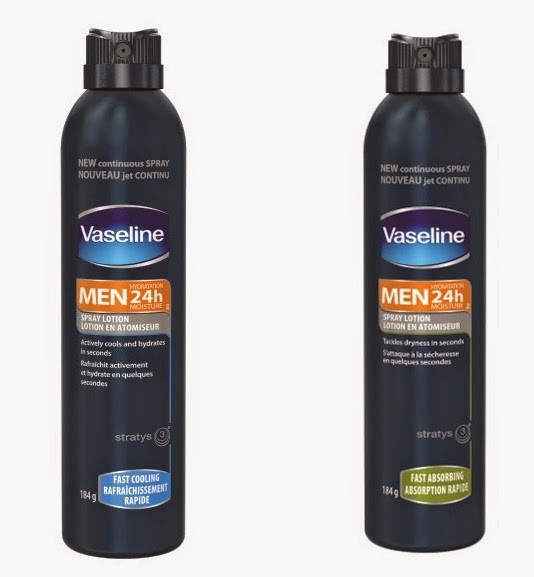 Well this time I want to introduce you all to the Vaseline Men 24 Hour Moisture Spray Lotion. My husband was pretty excited when we received both the Fast Cooling and Fast Absorbing spray lotions and I have to say they didn't disappoint. Both spray lotions relieves dry skin in seconds and leaves your skin feeling moisturized without that greasy and sticky feeling. It didn't feel heavy which was great for my husband. He has a hard time using some lotions because they don't feel good on his skin, but he was a huge fan of both the Fast Cooling and Fast Absorbing spray lotions. He loved that they both felt light on his skin and was easy to apply and he didn't miss any spots. I loved the smell of both lotions. SERIOUSLY! They smell so good and honestly if you're a man that puts on cologne, you won't have to after applying this lotion. The scent isn't too heavy, but definitely smells really good and this could definitely save you time instead of applying both lotion and cologne. The hubby has been using both spray lotions for over a month and has already had me by a couple more so that he can wear them throughout the Summer. I've noticed a huge difference in his skin. It feels softer and that's definitely a bonus! If you're looking for a quick on the go moisturizer that isn't too heavy and works quickly be sure to check out Vaseline's Spray & Go. They can be found at retails for around $6.99-$8.99 a bottle. If you want to give some other Spray & Go products a try check out our reviews for both the St. Ives' Hydration Spray Lotion and Vaseline Spray & Go Moisturizers, all products from Unilever.